You are Snoozehaven’s absolute worse adventurer. After all, you’re the only one from all your past parties to have returned from the various quests and adventures in one piece. For most, that would be counted as one of the best adventurers. Due to your…bungling nature, however, you’ve accidentally sprung traps on your comrades, mistakenly allowed your party to be cooked by ravenous monsters, and let’s not forget that cave-in you caused that somehow buried your entire party, yet you made it out alive. With your luck (or lack thereof), you could be the main character in your own comedy of errors. In Hero Master, that’s exactly what you are. Except, you still have to argue over who is going to be the party leader in your new-found group of misfits and castaways. And if your bungles get in the way of someone’s success? Well, such is the way of things. 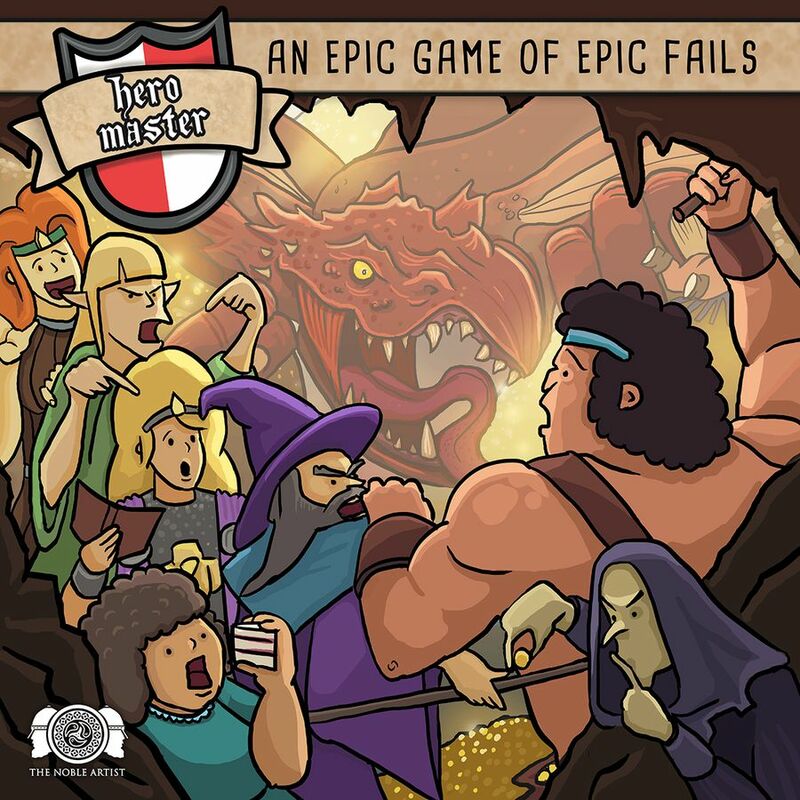 Hero Master is a light-hearted parody of any serious dungeon crawler, and has more depth than the comedic art might lead one to believe. Players fight monsters (while trying to avoid death) with the goal of coming away with the most gold at the end of the game. 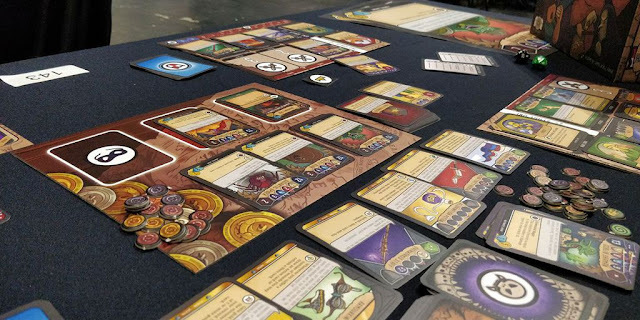 Players receive a race and a class, along with weapons, armor, abilities, and deck of cards that associate with their race/class combination. Players will need to hold on to the title of “party leader” if they intend to win. Of course, nobody actually likes being told what to do, so other players will try their darnedest to usurp power. Attacks are resolved using a D20, but mistakes happen (more so in the present company), and bungles will increase the odds of rolling a critical fail—usually to the detriment of a nearby hero. 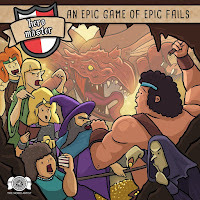 Not every would-be hero is cut out for the task, and when a group of such wannabes band together to hunt a dragon, the results are bound to be a blockbuster hit in comedy gold. Put your game face on (no, that’s your scared face), gird on your furry pants, and get ready to bungle your way to success! 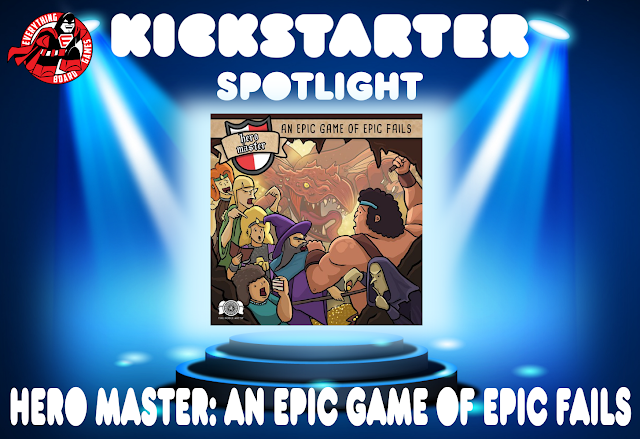 Hero Master is on is on KICKSTARTER between now and October 16, 2018 and has surpassed its funding goal of $11,844.